For museums outside of Eeyou Istchee , we ask that we are consulted and treated as partners for any interpretative work on collections from our region. Museums need to understand that we are experts on all aspects of our culture. We ask that museums, archives and heritage repositories do not reproduce or use photographs of our people without contemporary, informed consent from individuals or their descendants (especially photographs taken before the current digital / internet age). We are not objects for outsiders to interpret. The right to self-representation is guaranteed by the United Nations Declaration on the Rights of Indigenous Peoples. The OCAP® principles (ownership, control, access and possession), developed by the First Nations Information Governance Centre in 2011, guide how information about First Nations should be used, disseminated, protected and collected. These standards are referred to in the Tri-Council Policy Statement for Ethical Research Involving Humans, which is used by academic funding agencies within Canada. We ask that museums everywhere adhere to the OCAP principles and apply these to historic collections and documentation. Our research focus centers on the interests and needs of Eeyou community members. With that in mind, our research and resources give priority to research instigated by Eeyou community members. For external researchers, we are developing a Research Policy which will ensure that research is done with approval of Eeyou community members, and that external research is of interest to, and benefits the communities. Our General Statement of Research Principles guides our research approval process while our comprehensive policy is being developed. Our goal is for all external research to be undertaken in a good way, with decolonising principles in mind. The primary sites of Indigenous resistance, then, are not the rare open battles between the colonized and the dominant but the every day active refusals of complete engagement with agents of assimilation. This includes speaking in one’s own way, refusing translation and full explanations, creating trade goods that imitate core culture without violating it, and refusing to be a Native informant . ACCI opened in 2011, after many decades of planning and consultation with Eeyou community members. This community-based cultural institute model moves beyond what settler colonial museum practice refers to as ‘shared authority’ to the complete ownership and management of our regional cultural activities. Similar examples of nation and community-centred cultural initiatives are operated by the Nisga’a, Haida Gwaii, U’mista, Wendake (Wendat-Huron), and Mashteuiatsh, to name a few. ACCI is Eeyou-managed, with Eeyou curators and staff, and is therefore perfectly positioned to self-represent and self-curate cultural content. What makes our centres unique in comparison to the southern encyclopaedic museums is that we are presenting our own culture, using our own voices, for our living communities and the generations that came before us. In contrast to museums that were built on the empirical ‘Cabinet of Curiosities’ tradition – that showcased anything foreign and different to the colonial culture as a curiosity, to show the breadth of the empire or the power of the affluent collector, albeit presenting limited details about the actual culture – only what could be collected, understood by the person performing the transaction written in a notebook, our focus is our territory, our land, our people, our language, our beliefs and our history, what defines us as Eeyouch/ Eenouch . Our state of the art facility was designed by Douglas Cardinal, who also designed the initial layout and architecture of Ouje-Bougoumou, the Eeyou village where ACCI is located. The ACCI building includes a shop, educational programming spaces, a performance area, a ‘permanent’ exhibition space, visible storage areas, a reception area, a library, archival storage, a digitisation space, a loading dock with quarantine area, an elevator, an open office space, a meeting room, a conservation lab, archaeological storage, secure, climate-controlled collections storage, a photography lab, and two collections work spaces that have restricted access. Our facility has received the ‘A ranking’ for Cultural Property, meaning we are a designated space for the care of collections that are unique and rare, on par with provincial and national museums. Most of the objects on display are organics, which are sensitive to light and other environmental changes. Sensitive objects are rotated regularly, but the overall themes have remained unchanged since opening. Tenants in the building include the Cree Outfitting and Tourism Association (COTA), the Cree Native Arts & Crafts Association (Cree-NACA or CNACA) and archaeology, toponymy and language programming staff from the Cree Nation Government (CNG). …Aanischaaukamikw flows from the knowledge that Cree culture must be captured, maintained, shared, celebrated, and practiced… it is a living, breathing symbol of our determination to preserve and share the stories and legends, the music, the pictures, and the physical objects that show our unique interaction with the land, expressed through hunting, fishing, trapping, and underscored with a reverence for the land they have walked since time immemorial. For many decades in the 19th and 20th centuries, colonial administrators did not allow us to practice our culture and imposed their ways on our people using violent tactics, many of which still impact our communities today. The structure of colonialism is ongoing in the 21st century. But our culture and traditions, like other Indigenous communities across this land, are resilient. Our research projects at Aanischaaukamikw demonstrate the survivance of our traditions and knowledge keeping within the communities. We share the results of our projects within our communities, to strengthen our cultural inheritance into the future, and with outsiders as we decide is appropriate. Many of ACCI’s collections projects involve community-centred research using historic objects as talking points to learn from Elders and knowledge keepers. 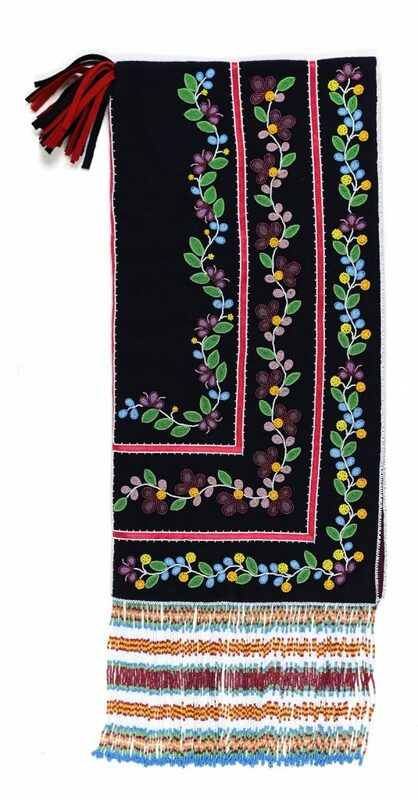 For example, in 2015, Paula Menarick completed a contemporary example of a beaded hood using the teachings of Elders who had the tradition of the hood in their families. Discussing the meaning and significance of beaded hoods in Eeyou culture with Elders, through the process of making the hood, has assisted in the revival of understanding and knowledge of this tradition within the region. Paula has described her feelings during the process of creation, noting: “As I worked on it, the hood started to reveal stories and meanings of its traditional uses, symbolism, and names of the certain parts of the hood to me. It was no longer only a hood; it became a key to the past that was unlocking the history of James Bay Cree people, and our Ancestors.” The hood itself, now in our permanent collection, has depth and richness in the documentation that links the hood with people from past with present. In 2017 we completed another project rooted in community, the travelling exhibition Footprints, A Walk Through Generations. The exhibition uses themes related to walking to celebrate teachings, values, and the rich cultural history passed down from our ancestors. Footprints follows the evolution of travelling through our eyes, allowing visitors to experience our stories, arts and traditional technologies through our shared culture. Beginning with our childhood Rites of Passage, we share the importance of walking and making our first footprints on Mother Earth. 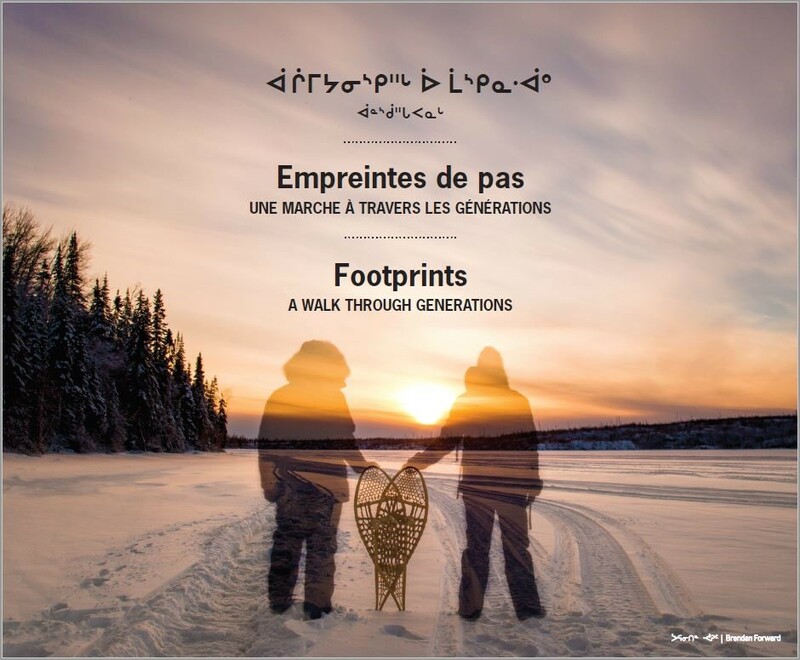 In walking for ceremony and journeys, we respect the many teachings of our Elders that are passed from generation to generation. An expression of Miyupimaatisiiwin (living life well), this exhibit encourages healthy living and inter-connectedness with the land that sustains us all. In 2018 Footprints toured our communities in our territory, a region of over 5000 km2 (an area that spanned 450,000 km2 prior to colonisation). Our exhibit will be at the Canada Museum of History from June to November 2019. The strength of our knowledge, community curatorship and interpretative methods in Footprints was recognised in 2018 by the Canadian Museums Association with the Award of Outstanding Achievement in the Exhibition – Cultural Heritage category and with the 2018 Governor General’s “History Alive!” award. 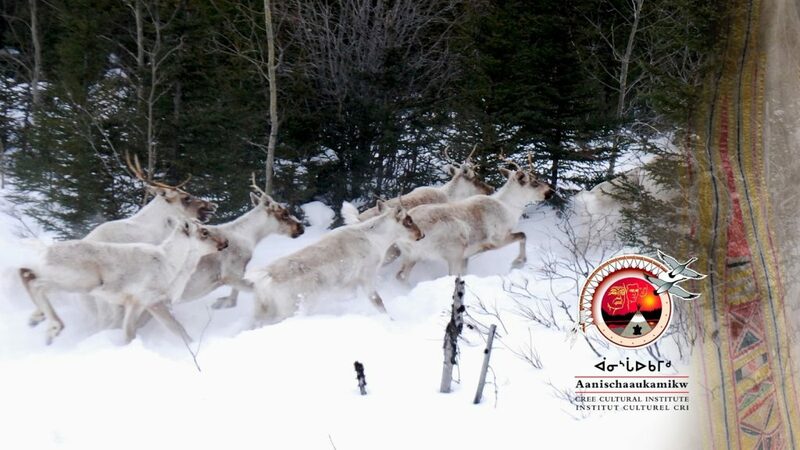 Rediscovering the Tradition of Painted Caribou Hide in Eeyou Istchee Facebook group banner. In 2017 we started a Canada Council of the Arts funded research project to investigate the tradition of painting on caribou hide using our community experts to evaluate observations made by outsiders, and to record knowledge held within communities. Painted caribou coats, often referred to as ‘Naskapi coats,’ have a tradition in Eeyou Istchee as well. As we link historic and contemporary practices to show the continuity and resilience of land-based learning that is expressed through cultural collections, this project highlights the self-determination and the strength of existing knowledge held by community members in Eeyou Istchee. For Eeyou Istchee, planning a cultural centre to self-curate content about our Eeyou culture was a goal for many decades. In 2011, the opening of Aanischaaukamikw Cree Cultural Institute was the realisation of the vision of our Elders, and is now the platform from which our efforts for self-representation and self-curation take place. This blog post has given an overview of these aspirations, and some of the projects we have undertaken to activate these desires. 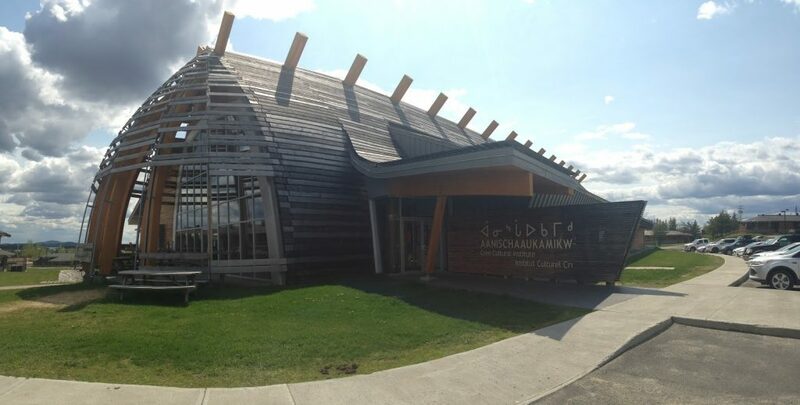 Aanischaaukamikw Cree Cultural Institute (ACCI) opened in 2011, after decades of planning by Eeyou Elders and community members. Located in Ouje-Bougoumou, ACCI is the regional cultural institute for Eeyou Istchee, a self-governing region, in what is now known as Quebec, that has 10 Eeyou / Cree communities: Whapmagoostui (Great Whale); Chisasibi (relocated from Fort George); Eastmain; Wemindji (Paint Hills); Waskaganish (Rupert’s House); Nemaska; Waswanipi; Ouje-Bougoumou; Mistissini and Washaw Sibi. Our activities include educational programming related to Eeyou culture, management of a cultural archive, library, museum collection, and permanent exhibition. Eeyou means ‘the people’ in the Eeyou language. We use Eeyou throughout this post when referring to the James Bay Cree people and communities. We retain ‘Cree’ when it is part of an official title, quote, or organisation name. Eenou is synonymous with Eeyou in the coastal dialect. The governing body (the Cree Nation Government) uses Eeyou to refer to both Eeyou and Eenou regions. Eeyou Istchee means ‘The People’s Land’. David Garneau, “Imaginary Spaces of Conciliation and Reconciliation: Art, Curation and Healing,” in Arts of Engagement: Taking Aesthetic Action In and Beyond the Truth and Reconciliation Commission of Canada, edited by Dylan Robinson and Keavy Martin (Waterloo: Wilfrid Laurier University Press), 2016: 23. Audra Simpson, “Settlement’s Secret”, Cultural Anthropology 26,2 (2011): 208, 212. ACCI Executive Director, Dr. Sarah Pashagumskum quoted from Aanischaaukamikw Cree Cultural Institute, ‘Exhibitions, Landscapes, Community Cultural Heritage and Healing: The development of a travelling exhibition – Footprints: A Walk through Generations’, a conference presentation with Darlene Bearskin, Collections & Exhibitions Department manager at Chisasibi Heritage & Cultural Centre and Laura Phillips, Coordinator of Collections & Exhibitions at Aanischaaukamikw, at the ‘Dynamic and Migrating Landscapes: Re-visioning Heritage Conservation’ conference at Carleton University, Ottawa, 22 April 2017.